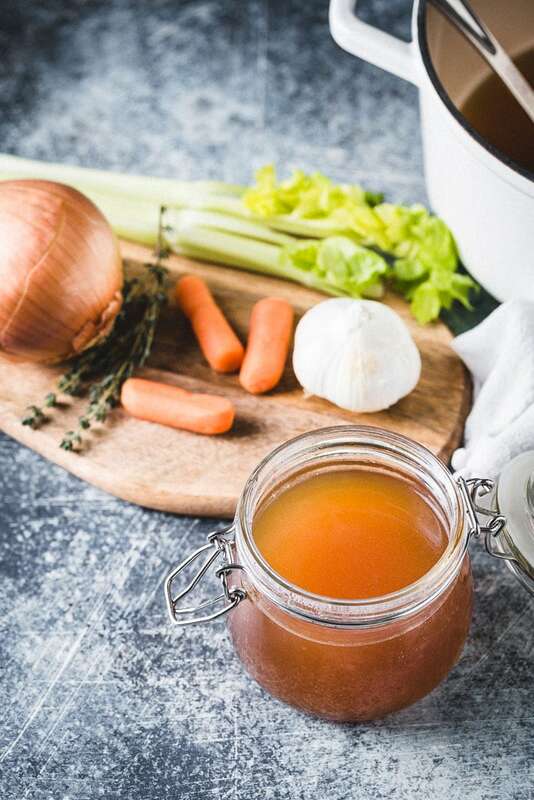 How to cook delicious and nutritious turkey stock with leftover turkey bones in an instant pot pressure cooker in just under an hour. So you spent all that time roasting or smoking your turkey (not to mention how much money you spent on it). It would be such a shame not to make some super easy, delicious and nutritious turkey stock with the leftover bones to continue the feasting. 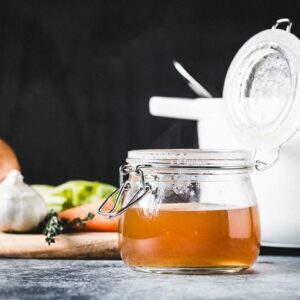 Making turkey stock in a pressure cooker or instant pot results in a beautiful gelatinous flavorful stock with tons of uses. The best part? It’s practically free and will be ready in under an hour. What are the different ways to make turkey stock? The fastest way to make turkey stock is in a pressure cooker or Instant Pot. The stock will be ready in about an hour. A much slower but equally delicious method is to simply cook the stock in a large stock pot or a slow cooker. This method might take four or more hours to fully extract all the nutrients and flavors out of the bones and aromatics. 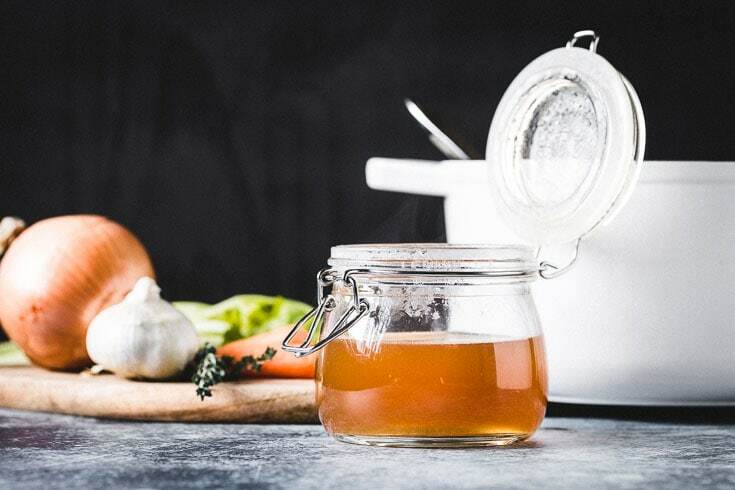 Cooking the stock uncovered in a stock pot will reduce the liquid as it cooks, which also concentrates the flavor. The stock is poured through a fine mesh strainer to separate out any solids, which are discarded after cooking. The stock is immediately chilled down and refrigerated overnight if not being used right away. Any fat solids that come to the top can be scooped off and discarded. This will yield about 2 quarts of turkey stock. How long to cook turkey stock in a pressure cooker / Instant Pot? 45 minutes at high pressure and an additional 15 minutes to naturally depressurize is how long it takes to extract all the flavors and nutrients. To concentrate the flavors further, you can continue to reduce the stock down. Use the stock for turkey gravy or freeze it for making gravy at your next turkey dinner. Can you freeze a turkey carcass for soup? Absolutely! Frozen turkey bones are just as good as fresh for making stock and soup. How long can you store turkey stock in the refrigerator? 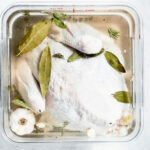 Turkey stock stores in the refrigerator in an airtight container for 3 to 4 days. How long can you store turkey stock in the freezer? Turkey stock can be stored in the freezer for up to 6 months. It’s best to first freeze it in ice cube trays then place the turkey stock cubes in plastic freezer bags for easy use. 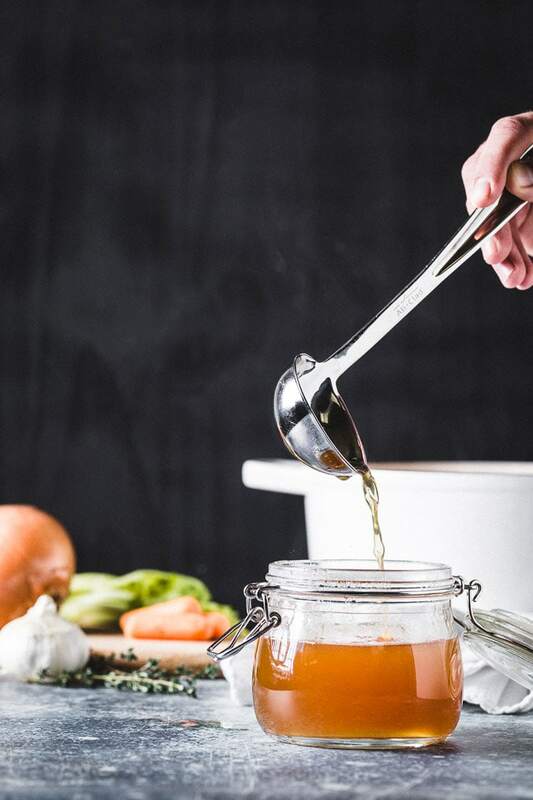 Turkey stock is made from the bones, body and whatever else is left of the turkey and a turkey broth is made from the liquid that the meat is cooked in. A stock has a much richer flavor and has more nutrients, which come from the bones. If the bones are roasted first, the color of a stock is also a lot darker than a broth. Place all ingredients in the pressure cooker or instant pot and fill with cold water to the fill line. Cover and bring to high pressure, then set the timer for 45 minutes. Turn the heat off and naturally let the pressure subside before removing the lid. Remove the carcass and other large bones with tongs to make pouring easier. Pour the stock through a fine mesh strainer into a large bowl or container. Discard everything but the liquid stock. Ideally, the stock is chilled immediately over an ice bath to rapidly cool it down before covering and placing in the refrigerator. Refrigerate overnight and skim off and discard any fat that has risen to the surface. If you are missing any of the ingredients (besides the turkey), it will still come out great. If making turkey stock in a stock pot and not a pressure cooker, use the same recipe but simmer it uncovered for 3 to 4 hours, or until it is flavorful. I prefer not to add salt to the stock unless eating/drinking it straight because it will bring out a lot more flavor. 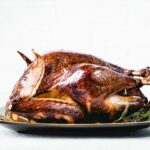 The amount of salt needed also varies if your turkey was brined. Store in refrigerator for up to 4 days or in the freezer for up to 6 months. You can continue to reduce the turkey stock uncovered to concentrate the flavors further if preferred. 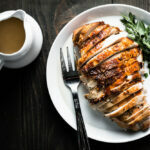 Roasting just the turkey breast is a delicious and pain free alternative to cooking a whole turkey.